Nanoparticles (NPs) and its disposal via anthropogenic activities are a new concern nowadays. The impact of copper on plant metabolism has not yet been studied in detail. In this study, Copper oxide nanoparticles (CuO NPs) were synthesized by wet precipitation method using copper acetate monohydrate precursor. 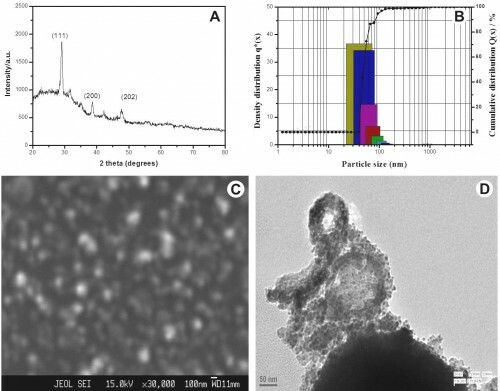 Powder X-ray diffraction, particle size analyzer, scanning electron and transmission electron microscope analysis revealed that synthesized CuO NPs are in nano size range. The impact of synthesized NPs on germination and seedling growth of Vigna radiata were tested. Germination and seedling growth of the plants were almost unaffected at lower concentrations while significant inhibition was recorded at highest 1000 mg.l-1 concentration of NPs as compared to control. Protein and sugar content were used as biochemical parameters to estimate the effects of different concentration of CuO NPs on the metabolism of seedlings. The amount of sugar and protein registered slight higher value at lower concentration and sharply decreased with increase in concentration. By analyzing this compiled information, it is evident that CuO NPs exhibits a toxic effect on growth and physiology of test plant while at very low concentration effect of NPs may be little favorable also. Fig. : Characterization of synthesized CuO NPs (A) X-ray diffraction pattern of the synthesized CuO NPs (b) Particle size distribution image of the synthesized CuO NPs (C) SEM image of the synthesized CuO NPs (D) TEM image of the synthesized NPs.